This information has been devised by members of the Stone Trust and separates the build process into its component parts. 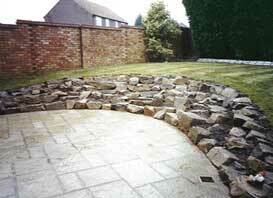 Is a DIY dry stone wall possible? Chisels are great for splitting stones along their natural bedding (with the grain), and can be used for trimming and other breaking. While they give you more control, they take more time to use, so most skilled wallers only use them when precise control is needed. Points are like chisels that taper in from all sides to leave a point that can be used for removing high spots.